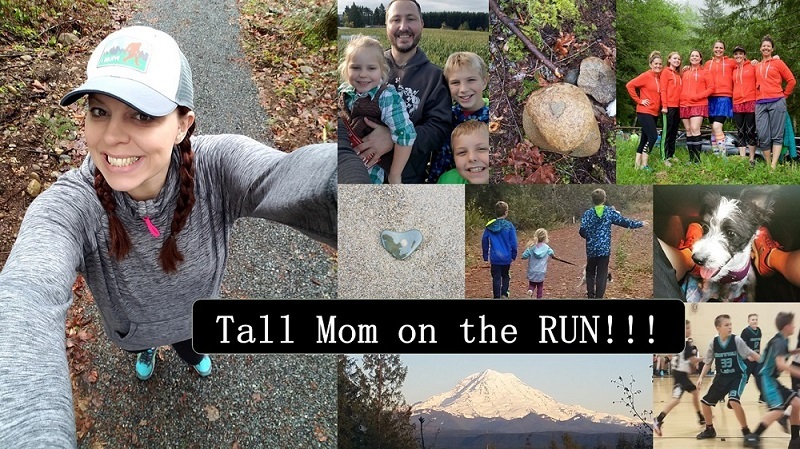 Tall Mom on the RUN: How Does She Do it? Have you seen the preview for the new movie with SJP? From the trailer it appears to be a movie about a woman who balances work, kids, family and EVERYTHING else, leaving people to ask "How does she do it?" My Big Girl Job has been BUSY, leaving little time for my mid-day runs. I usually look at my week ahead calendar and plan my running days around meetings and after work events. My office has a locker room, running trails nearby and showers, which makes being active SUPER CONVENIENT!! Add the fact that my running buddy Kerrie HERE is just 1.3 miles down the road, I have a great mid-day running set up. I won't be able to get in more than 7 miles during my lunch run, but that is enough to get in a great sweat and maintain my fitness. When I am in training mode and know I have a busy work week I will plan EARLY morning runs with a buddy or after work runs with the family or on a treadmill. I am BLESSED to be married to the most amazing husband, Muscle Man supports me in all that I do. He is a stay at home Dad, which means that I am not chained to all of the house chores, we tackle them together. I love doing laundry and he likes to cook, WIN WIN. On weekends when I have Running buddies coming into town like Jess HERE this weekend, Muscle Man will often take the kids to my in-laws so that I can enjoy and even host Slumber parties :) He knows that running and friends help me to be a happier person, which equals a better wife and mother. As I plan my 2012 racing calender I will talk with Muscle Man because when I commit to something I need his full backing and support. His response "Do what makes you happy." There are days when I feel like my Running takes away from our kids, the Mommy guilt is ever present. 20 miles on a Saturday morning when I could be taking the kids to the Zoo or sitting down to a family breakfast. This GUILT will never go away, it reminds me that my priorities are in place, that morning I chose running, but my #1 is my family. Before I ran I was heavy, so heavy that playing with my young son was difficult. These days I have endless amounts of energy and we are teaching our kids what it means to be active. Through my Running I am setting them up with a role model, "Mommy runs to the Finish line," "Mommy got a medal," "Mommy can sprint around the track to come tickle me," Mommy and Daddy push us in the stroller." These are GOOD things for our kids to have. And Family Runs are my most CHERISHED of my workouts. I love your post! Balance is HARD. My husband is in the oilfield, which means he is absent for 15 days, then home for 5 days. We have no family in the province to watch the kids so I can run. My kids have lots of activities and I work part time. BUT, last year after I was the highest weight EVER I finally decided to put myself on the calendar. I plan my workouts at the beginning of the month for the WHOLE month. I squeeze in a run after work, but before the kids are finished school, I run when they have a birthday party/activity to go to and when I need to, I book an awesome babysitter for them so I can squeeze in a run. I am more balanced, have more energy and am happier than ever....and even though hubby isn't home much, he supports my running 110% which rocks ). Well said! I am in awe of the moms and dads that seem to do it all, and maintain that balance. It may not go smoothly every week, but you make it work! Balance is extremely difficult! I remember, before I decided on grad school, that my job required finding a balance that worked for me. I was up at 4:30 and out the door by 5 most mornings to fit in my run and be at the office by 8. That opened up the evening so I could spend time with friends or just relax. It never ceases to amaze me when people can balance family, work, and running. Kudos for doing such a good job at it! Balance is hard, but with so many important things I have to make myself a priority. I get up early to work out, or workout often after I tuck my little one into bed. Findin the balance is important and remembering that it is ok to rest or skip a workout for your family commitments. Also finding workouts that are family oriented are always a bonus. I love this post! I love that there are other moms/wives that get asked the same thing. How? My only reply is, "I just do." Lol But this post has given me something to think about when I get asked this the next time. Love this post....oh and also SJP!!! I do the early morning runs before work (only 1/2 hour lunch if that) or I run Em to the park after school. I agree though...if I got paid for running and blogging I would be all set! One question for you...could you please clone Muscle Man or perhaps rent him out...or maybe he could hold classes for other hubbies? That is one place that I struggle, besides the Mommy guilt. My hubby is not a runner and agrees to many of my races but there is always a price to pay later down the line. I know this is a balance that we need to find but it many times leads to me stressing through runs and working all day to clean and cook. One day! I think both Jesse and I can find this to be tough, especially with a baby! We haven't got it all figured out yet, but we are definitely getting better! I don't know how you do it either...and I hear the same things from moms at work directed at ME! Why, because I get up at 5am to go to the gym, and all I have to worry about is making sure my puppy goes on a 5 minute walk and my husband has a lunch for work? You moms are my heroes. I am amazed at all of you. When I become a mommy, I don't know how I'll balance running, but I'll try. Thanks for showing it can be done! Great post! I could not do it without the help of my hubby. He has always been super supportive of my working out. I try to get my runs in after work before picking up the kids from school. They always beg to stay longer to play with their friends- so less mommy guilt. Other days, I try to do it after they've gone to bed-which is so hard for me, because I'm tired by then too! 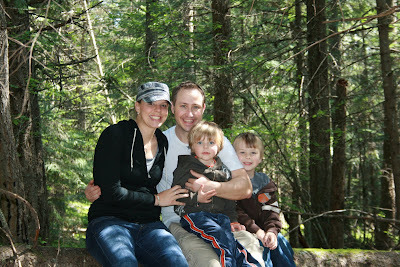 Weekends, when I do my long runs, by hubby as been taking the boys on bike rides or hikes. I miss doing some of that- but it is also good bonding with daddy. I feel like I'm being a good role model for them and teaching them about goals, and dealing with losing, etc. I didn't know anyone actually likes to do laundry. That's incredible. I don't have kids, so I don't have a lot to balance, but I do wake up early to get my workouts in and make time at night to blog. Oh, I also have an amazing husband. I love doing laundry too, but hate doing the dishes..so guess which one my husband does? I love running during my lunch break at work. We don't have showers there unfortunately so I pack a washcloth and do the best I can in the sink. :) I hope my coworkers don't hate me too much! I do it by... Beliving that taking care of me is important in order to be a better servant to others. I let go of all expectations and live life one second at a time. And I pray A LOT :). Great post! Balancing being a parent/careerperson/runner is HARD WORK. LOVE this post! Yes, I wanna see that movie and YES, sounds like you deserve that phrase as well! When I was a working mom, exercise happened for me on my lunch/conference break-I taught P.E. and health, so getting my workouts in was fairly easy. For some of my friends that are very unhealthy, I feel for them because their 8-5, sitting behind a computer jobs DO NOT allow for exercise, then getting home and taking care of hubby and kids is it's own job...just wish it was an easier answer for them. You are an AWESOME role model for your family, don't EVER feel guilty for raising a healthy family and setting a HUGE example of what being active and healthy is all about...BE PROUD :) VERY PROUD! I love that! "Do what makes you happy." So wonderful. I am sure Muscle Man is able to support you so full because he trust in your support toward him. Just like it should be. Wonderful! I feel like we all get overwhelmed and rely on seeing our "imaginary" friends "Doing It" to help us remember that we can keep all the balls in the air beautifully. When I feel burdened I think of others, like you, T, G and Marlene; all in different situations but each "doing it" and making it all (mostly) work. Thanks for the reminder that I can!